Createspace Independent Publishing Platform, 9781518633744, 286pp. 2016 LEFTY Award Finalist Best Humorous Mystery To Laurel McKay, there's nothing better than spending an autumn afternoon in the Apple Hill area, munching on caramel apples and cinnamon donuts. It's a good thing daughter Jenna's landed a seasonal job at Apple Tree Farm and Bakery. Then Laurel stumbles over the bakery owner's corpse coated in powdered sugar. Axel Thorson was a well-respected member of the community. Who might benefit from his death? When the police arrest the heartthrob grandson of the bakery manager, Jenna decides to help him by solving the case herself, a move that lands her in jail. With Laurel's detective honey in another state, and her octogenarian grandmother threatening to chase down the culprit, what's a soccer mom with a sweet tooth to do but go undercover. 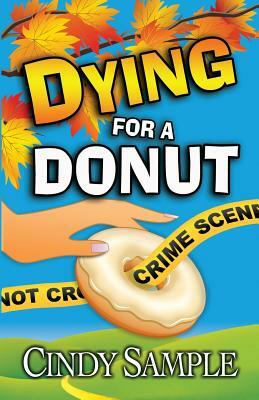 Detecting among donuts should be a piece of cake, but not if Laurel discovers first-hand that sugar can kill you. Dessert Recipes Included. Cindy Sample is a former CEO who decided plotting murder was more entertaining than plodding through paperwork. She retired to follow her lifelong dream of becoming a mystery author. Her experiences with online dating sites fueled the concept for Dying for a Date, the first in her national bestselling Laurel McKay mysteries. The sequel, Dying for a Dance, winner of the 2011 NCPA Fiction Award, is based on her adventures in the glamorous world of ballroom dancing. Cindy thought her protagonist, Laurel McKay, needed a vacation in Hawaii, which resulted in Dying for a Daiquiri, a finalist for the 2014 Silver Falchion Award for Best Traditional Mystery. Laurel returned to Placerville for her wildest ride yet in Dying for a Dude. The West will never be the same. Dying for a Dude was also a 2014 Next Generation Indie Award Finalist in both mystery and humor. Then on to Dying for a Donut, the tastiest mystery of them all. Cindy is a three-time finalist for the LEFTY Award for best humorous mystery and a past president of the Sacramento chapter of Sisters in Crime. She has served on the boards of the Sacramento Opera and YWCA. She is a member of Mystery Writers of America and Romance Writers of America. Cindy has two wonderful adult children who live too far away. She loves chatting with readers so feel free to contact her on any forum. Sign up for her newsletter to find out about upcoming events and contests. http: //cindysamplebooks.com/contact/ Connect with Cindy on Facebook and Twitter http: //facebook.com/cindysampleauthor http: //twitter.com/cindysample1 Email Cindy at cindy@cindysamplebooks.